(a) Multiheterodyne spectroscopy using two frequency combs with slightly different repetition rates. (b) Experimental setup. Inset shows real laser frequency combs on the copper mount, both of which are silicon lens-coupled. (c) Lasing spectrum of one device under comb operation. The terahertz region is of great importance for spectroscopy since many molecules have absorption fingerprints there. 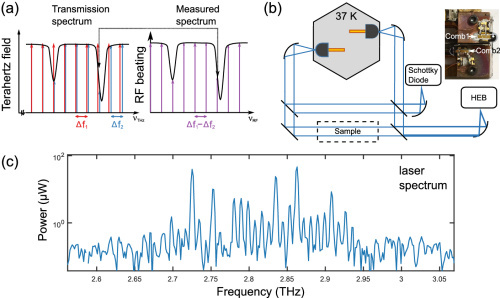 Frequency combs based on terahertz quantum cascade lasers feature broadband coverage and high output powers in a compact package, making them an attractive option for broadband spectroscopy. Here, we demonstrate the first multiheterodyne spectroscopy using two terahertz quantum cascade laser combs. Over a spectral range of 250 GHz, we achieve average signal-to-noise ratios of 34 dB using cryogenic detectors and 24 dB using room-temperature detectors, all in just 100 μs. As a proof of principle, we use these combs to measure the broadband transmission spectrum of etalon samples and show that, with proper signal processing, it is possible to extend the multiheterodyne spectroscopy to quantum cascade laser combs operating in pulsed mode. 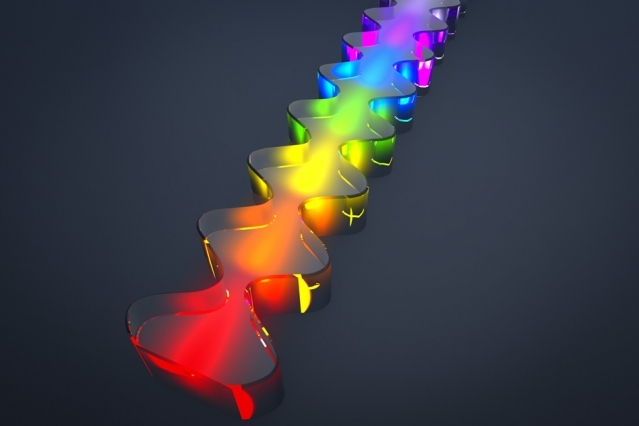 This greatly expands the range of quantum cascade lasers that could be suitable for these techniques and allows for the creation of completely solid-state terahertz laser spectrometers. Terahertz radiation, light whose frequency lies in the 0.1–10 THz range, is of great importance for spectroscopy since many molecules have strong rotational and vibrational resonances in this frequency range. As a result, much effort has been spent developing terahertz spectroscopic techniques to address the tradeoff between detection bandwidth, frequency resolution, and acquisition time. Researchers have demonstrated the first THz multiheterodyne spectroscopy using quantum cascade laser frequency combs. The spectral coverage is 250 GHz at 2.8 THz, limited by the bandwidth of the lasing spectrum, and as a proof-of-principle we have used them to measure the transmission of etalon samples. As broadband gain media designs continue to develop, they expect much broader coverage of the THz spectrum. Moreover, they have shown that even under pulsed-mode operation, laser frequency combs are still feasible for multiheterodyne spectroscopy. Pulsed-mode multiheterodyne spectroscopy shows great promise for reducing the cooling power constraints, allowing for the use of compact Stirling cryocoolers. Together with room-temperature Schottky mixers as detectors, this will enable a very compact spectroscopy system at the THz region.